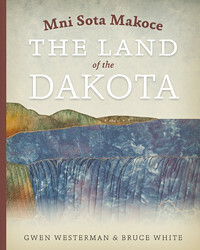 An intricate narrative of the Dakota people over the centuries in their traditional homelands, the stories behind the profound connections that hold true today. Much of the focus on the Dakota people in Minnesota rests on the tragic events of the 1862 U.S.–Dakota War and the resulting exile that sent the majority of the Dakota to prisons and reservations beyond the state’s boundaries. But the true depth of the devastation of removal cannot be understood without a closer examination of the history of the Dakota people and their deep cultural connection to the land that is Minnesota. Drawing on oral history interviews, archival work, and painstaking comparisons of Dakota, French, and English sources, Mni Sota Makoce tells the detailed history of the Dakota people in their traditional homelands for at least hundreds of years prior to exile. “Minnesota” is derived from the Dakota phrase Mni Sota Makoce, Land Where the Waters Reflect the Clouds—and the people’s roots here remain strong. Authors Gwen Westerman and Bruce White examine narratives of the people’s origins, their associations with the land, and the seasonal round through key players and place names. They consider Dakota interactions with Europeans and offer an in-depth “reading between the lines” of historical documents—some of them virtually unknown—and treaties made with the United States, uncovering misunderstandings and outright deceptions that helped lead to war in 1862. Dakota history did not begin with the U.S.– Dakota War of 1862—nor did it end there. Mni Sota Makoce is, more than anything, a celebration of the Dakota people through their undisputed connection to this place, Minnesota, in the past, present, and future. Dr. Gwen Westerman, a professor of English and humanities at Minnesota State University–Mankato, specializes in multi-cultural and Native American literature. She serves as director of the Native American Literature Symposium, is the recipient of several prestigious grants, and has published widely on contemporary American Indian literature. Her poetry has been published in Yellow Medicine Review, Water~Stone Review, and other journals. Her award-winning quilts have been displayed in numerous venues. She is an enrolled member of the Sisseton Wahpeton Dakota Oyate. Independent historian and anthropologist Bruce White researches and writes for Indian tribes and government agencies. He is the author of We Are at Home: Pictures of the Ojibwe People. Foreword by Glenn Wasicuna, Director of Dakota Studies, Tiospa Zina Tribal School for the Shakopee Mdewakanton Sioux Community. Glenn has taught the Dakota language at tribal colleges, Gustavus Adolphus College, and served as a consultant to the University of Minnesota on the Dakota language. Interview with Gwen Westerman about her artwork.